Before you start designing your entry, this is a must read! It will give you an understanding of the rug design and manufacturing process and the product you are designing for. Want even more insider info on rug design? Why not attend one of our workshops in Sydney, Brisbane, Melbourne, Auckland, Singapore or Hong Kong? The rug you will be designing is a hand tufted rug. Hand tufting is very much a “colour by numbers” process. Hand tufted rugs are produced by shooting yarn through a tufting gun into a stretched fabric frame, much like a stretched canvas. A fabric is stretched to the size of the rug required; the design line drawing is transferred onto the back of the fabric, in reverse, as the tufting is done from the back of the rug. The line drawing is numbered with the colour placement. 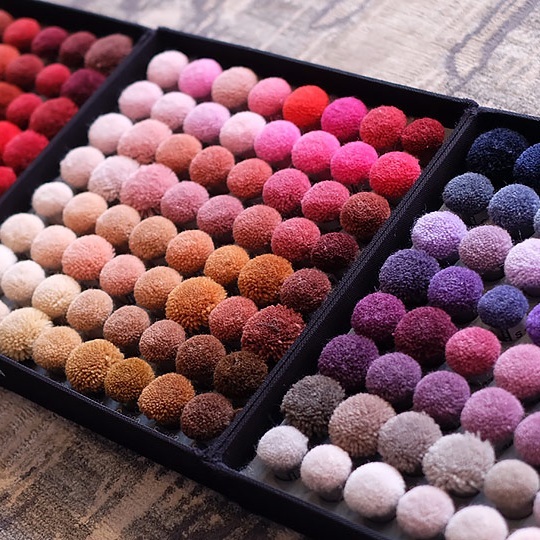 Each shape and colour is tufted separately, so the more shapes and colours the more intricate the design, and the longer it will take to tuft. Once the tufting is complete the back is glued, left to dry, then edged are hemmed as required.The rugs are then finished, trimmed, shaved and carved. When creating you rug design, try to consider the application of the rug. Some rugs rugs are an aesthetic statement piece, or subtly bring the elements and furnishings in a space together. Rugs can provide relief from hard surfaced spaces, reduce noise and creating a warm welcoming environment. The size of a rug in a space can increase or decrease the sense of space in a room. A small rug framing a coffee table can shrink a lounge room as your eye is drawn to the centre, but if you have an ample size rug it can suggest the sense of opening up the space, drawing your eye out, and defining an area when there are no walls. Colour makes the biggest impact in a rug - we are drawn to colour. The colours you use in your rug designs will influence an interior space. Ask yourself: could I live, work, and enjoy myself in a space that uses these colours? Some colour palettes work well on small scales but are overwhelming on large scales, and vice versa. Scale is a really important element in designing rugs. Especially when you are working on a small scale, you need to consider how big the design will be when produced to 1:1 scale or full scale, as shapes can become too big and novelty size, or too small and insignificant, depending on the intention. Your rug will be made using New Zealand Wool, and up to 25% bamboo silk. Bamboo silk can be used as a detail or highlight, and has the appearance of silk, lighter in colour than wool due to its sheen. The standard yarn we use is a 1 Ply twisted yarn, which produces a fine, smooth, even cut pile surface. Cut pile is low and dense with an even surface, and can be tufted at various heights. Yarns can also be tufted as Loop Pile, where yarn is literally looped over and over, only exposing the side of the yarn. Carving is a finish applied to the rug after it has been tufted and shaved. Like carving in wood, the design lines can be carved to give a more defined and graphic feel to the rug. Without carving, you will achieve a more raw, rough, sketchy line and finish. Your entry can use up to a maximum of 6 colours - the more colours you use the more expensive production becomes. In rug design we generally work with as few colours as possible for this reason, but we also appreciate we are expecting outstanding design, and do not want to restrict the design process. However, when designing you need to consider: can you reduce the number of colours? Will this be detrimental to the overall design? We would highly recommend avoiding white or cream as a main background colour. We have disclaimers on white rugs as they are difficult to keep clean in production and delivery, and hard to keep clean once delivered to our clients.